Brick is among the most common and longest-lasting building materials around. And while you're probably more familiar with it in relation to accent walls, fireplace surrounds, and exterior facades, brick is also great for interior flooring, specifically in the kitchen. For starters, it's durable, low-maintenance, and totally customizable. 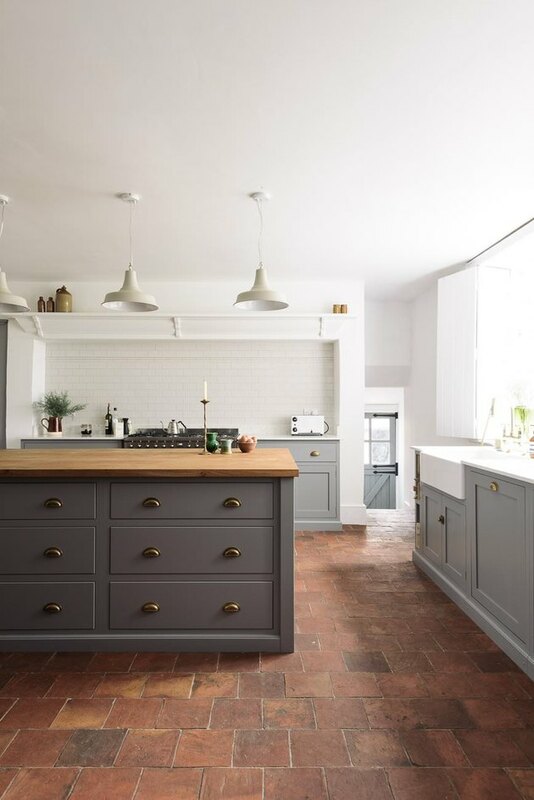 And if all of this isn't enough to sell you on brick kitchen floors, we've rounded up six stunning examples that are sure to seal the deal. 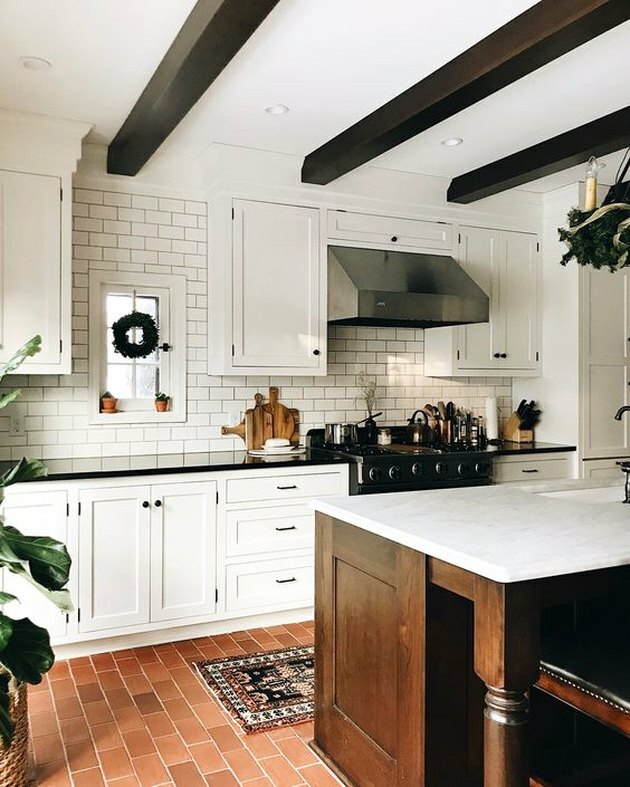 Brick floors, ceiling beams, and a dark walnut island, coupled with white cabinets and a white subway tile backsplash all contribute to designer Patti Wagner's cozy modern farmhouse aesthetic. Swoon! 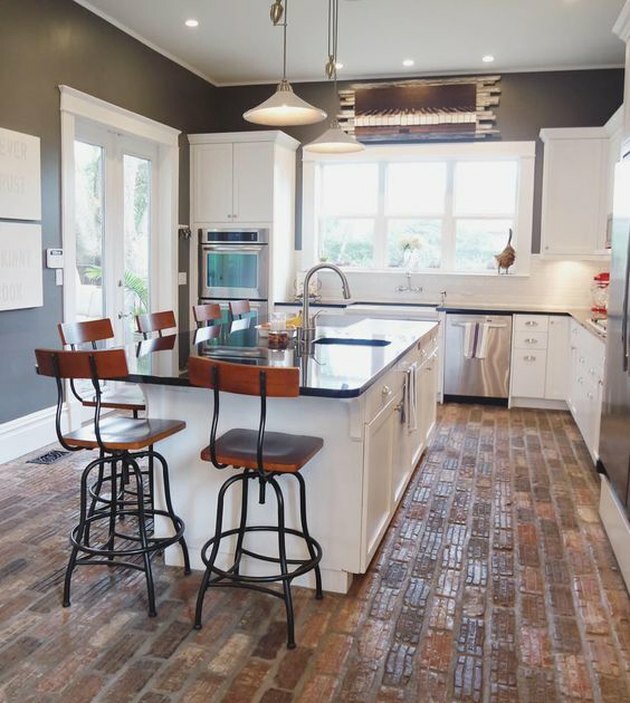 Evocative of an era gone by, Natasha from Linenwood Home combined rustic, industrial-style counter stools and repurposed old road pavers in her kitchen. Stainless steel appliances and white cabinets lend a decidedly modern edge. We love the timeless allure of this rural design from Oz Architects. The recipe for success? 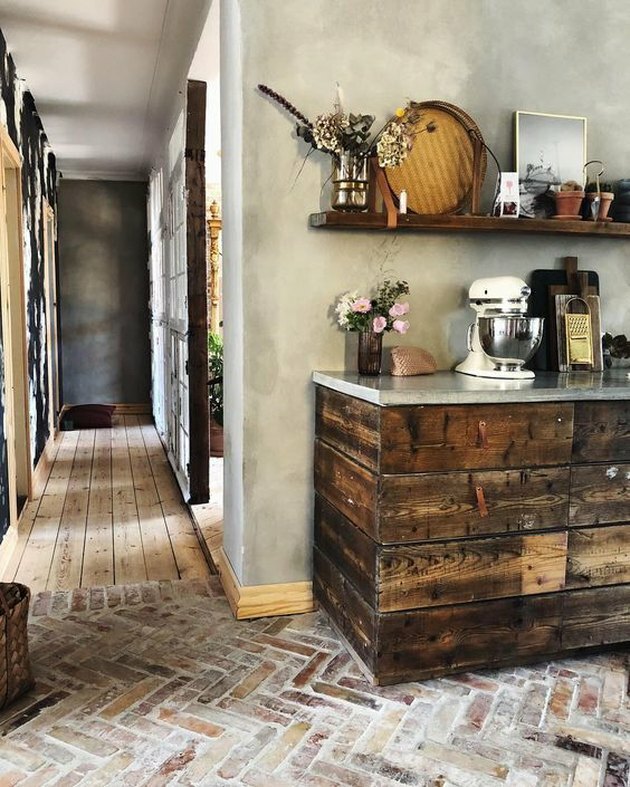 A functional layout, enhanced by enduring materials and farmhouse flourishes, such as the weathered brick kitchen floor. The white window shutters, original mantel above the stove, and the brick kitchen floor exude English country charm. Since the rust-colored material is warm and earthy, it's a great way to balance spaces with a lot of white and a minimalist approach. The rich wood finish of the cabinets and the distressed brick kitchen floor, in a herringbone pattern, lend a well-worn allure. But this Copenhagen cook space is far from a relic, as evidenced by new appliances and a fresh layout. 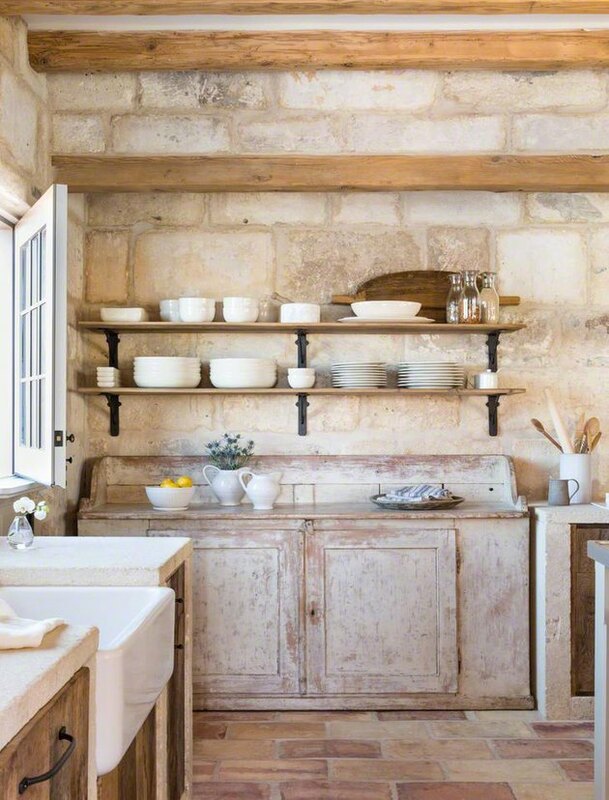 You might think this open-plan kitchen looks like it would be found in some quaint little village, and you'd be right. 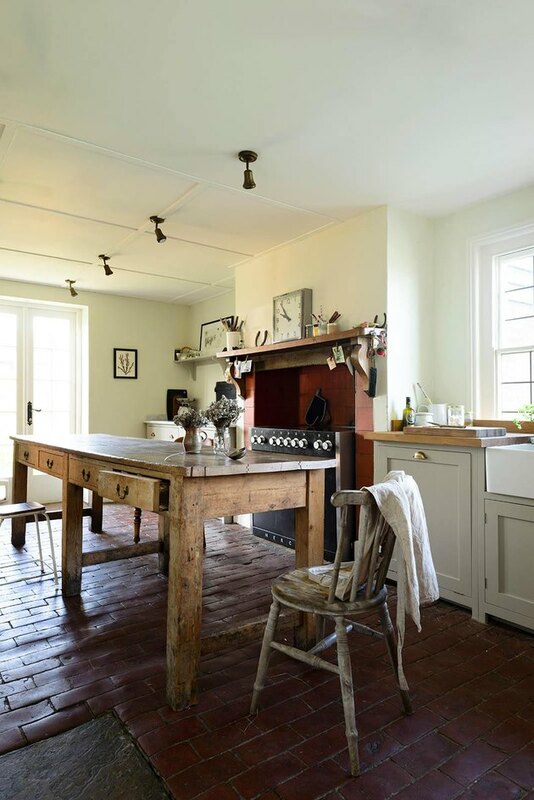 Nestled in the English countryside of West Sussex, the gently worn brick flooring in this bucolic kitchen coexists with a mix of oak and marble countertops, vintage pieces, and eclectic art. The effect is streamlined yet soulful and inviting.